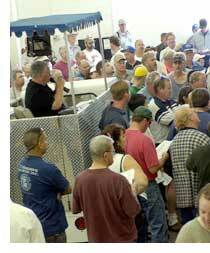 Vail International, Inc. Auctioneers has been in the Auction Business since 1981. From selling small businesses, to 40 million dollar sales of nuclear power plants, to selling the top western thoroughbred quarter horses, Vail International is here to service your auction sale needs with the personalized attention you deserve. We are licensed in the state of Washington. Our car and vehicle division has grown each month selling more than 100 cars, trucks, mini-vans, collector vehicles, construction equipment at our auction center, located at 312 N. 20th in Pasco, Washington. Vail International, Inc. would like to encourage you to explore our credibility, integrity, and service records! We can provide references from past and current clients. We are confident that our past performance record will answer all your questions.